VIS celebrated Grandparents’ Day on 30th November. The theme was Joys of childhood depicting how a child enjoys nature around him finding happiness in everything. The programme began with Ganesha Dance seeking blessings of Lord Ganesha. The action song by playgroup children left everyone spell bound. The Sarv Dharm and Together Dance highlighting unity in diversity touched the hearts of one and all. Dances of different seasons and the heavenly Apsara Dance mesmerized everyone. 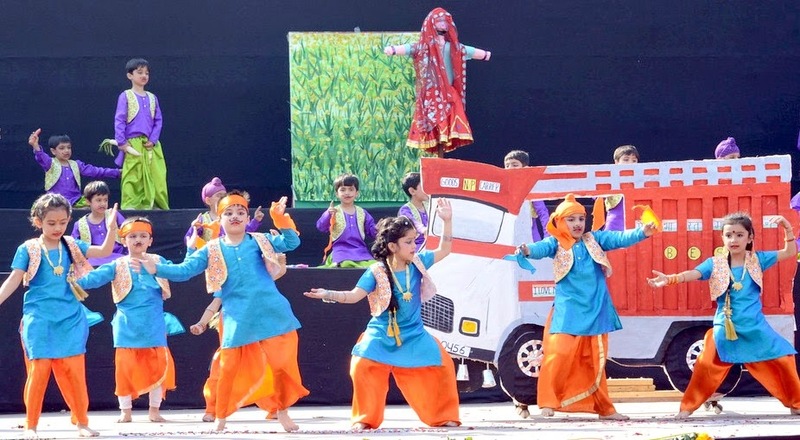 While the Tandav by students of class I created goose bumps, lively and energetic bhangra was purely entertaining. The highlight of the show were the tiny anchors who surprised the audience with their confidence and wonderful compering, supported by Ms. Anjana Sharma Coordinator of VIS Kids. The Guests of Honour for the occasion were Dr. Anila Bhatara and Prof. B. L. Handoo. Lamp lighting was done by the guests of honour along with the Chairman, Shri Rajpal. The Director Mrs. Mrinalini Kaura welcomed the gathering. The Headmistress, Pre-Primary wing Ms. Poonam thanked the management, staff and the parents for all their support. A grand showcasing of the colours of Glamour and Fashion at India International Style Week!